"Kenny and Mikey:At the sci-fi convention!" How exciting!Kenny meets Mikey the Bear at a sci-fi convention! 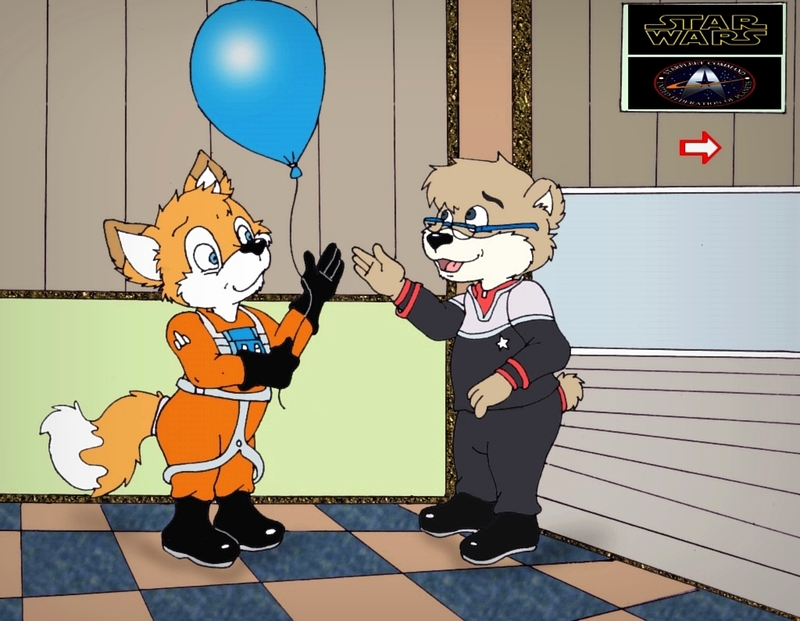 It's like "Star Wars" meets "Starfleet"!And to celebrate this new friendship, Kenny offered him a balloon, as a sign that from now on they will be friends ... and beyond the stars! Its very nice to see star trek & star wars fans getting along! OMG!Adorable idea and so cute,hun! daww this is so cute! That's the first time I've seen someone favor the DS9/TNG Movie era uniform. I'm the most partial to the TOS movie uniforms. From Star Fleet commander, "Hmmm...this pretty blue balloon. Very high tech indeed".